This moving-on self-led tour takes you from the Rhône over the Vercors to Mont Ventoux and the Vaucluse, then east via Sisteron and the Durance valley to the Ubaye Valley and Barcelonnette, and south over the Southern Alps to the Grand Canyon du Verdon, the Haut Var and the Lubéron. The tour would normally start and finish near a European Bike Express (Bike Bus) stop, though no transport is included in the package. Variations on the standard tour are available, but the nature of the terrain means that all days involve considerable climbing. The tour and any variations on it are for the experienced self-reliant cyclist. The tour can take place any time between mid June and mid September. Cycle from Valence into the Vercors, climbing the Col de la Bataille to stay at the Col de la Machine. 70km. Stay 1 night. Cycle through the Combe Laval, Pont-en-Royans and the Gorges de la Borne to the Col de Rousset. Descend to Die in the Drôme Valley. 97km. Stay 1 night. Cycle through the Gorges de L'Escharis to Dieulefit. 78km. Stay 1 night. Cycle through the Baronnies to Sault. 87km. Stay 2 nights. 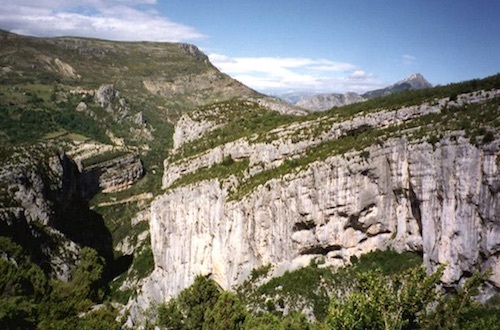 Cycle across the Albion Plateau and over the Signal de Lure to Sisteron. 98km. Stay 1 night. Cycle over the Col des Sagnes, the Col des Garcinets and the Col des Fillys to the Ubaye Valley and Barcelonnette. 102km. Stay 2 nights. Loop ride from Barcelonnette - circuit of the Col d’Allos, the Col des Champs and Col de la Cayolle. 124km. Or shorter circuit or rest day. Cycle over the Col de la Bonette to Col de la Couillole. 101km. Stay 1 night. Cycle down the Gorges du Cians to Aiglun. 67km. Stay 1 night. Cycle to the Canyon du Verdon and La Palud-sur-Verdon. 104km. Stay 1 night. Cycle through the Haut Var villages to Barjols. 104km. Stay 1 night. Cycle over the Lubéron to Apt. 97km. Stay 1 night. Cycle through the Vaucluse villages to Sault. 42km. Stay 1 night. Distances: The daily average on the route above is 89km. Variations on this route are possible in terms of the number of days, daily mileage, avoiding the highest cols, starting and finishing points and the number of nights spent in the same place. You will be staying in 2- or 3-star hotels. Rooms are booked on a half-board basis, sharing two to a room. Single occupancy can be booked for a supplement. Vegetarian meals can be arranged if requested at the time of booking, though choice may be limited. No support vehicle is provided. Participants are expected to carry their own luggage. The price of £1,200 is for 14 nights (the cost of additional or fewer nights will be added or deducted on a pro-rata basis) and is calculated at a rate of 1.12 Euros to £1 sterling (Based on exchange rates published on www.x-rates.com on 14 September 2018; please note Booking Conditions, clause 3). A deposit of £120 per person is payable upon booking, with the final balance of £1,080 per person to be paid 10 weeks prior to departure. From the spectacular Vercors Mountains in the north of the area, this tour takes you through sparsely populated uplands with their lavender fields and perched villages, far from the busy Mediterranean coast. The Southern Alps offer climbs of the 2,240 metres Col d'Allos, the 2,326 metres Col de la Cayolle and the 2,715 metres Col de la Bonette, whilst the Canyon du Verdon to the southeast is one of the most impressive natural sites in Europe. The standard tour includes Mont Ventoux, the Lubéron, the Var Hills and the unique and magnificent Cians Gorges. The tour would normally start from Lyon Sud or Valence European Bike Express stops and return from the Orange European Bike Express stop. An average day on the standard tour is around 89km (56 miles) but there will be opportunities to take short cuts and there are rest days. All days involve climbing, sometimes for several miles. Variations on the standard tour route are, however, possible in terms of total days, daily mileage, number of nights in the same place and starting and finishing points. You need to discuss with the Tour Manager what you want, who will then put together an individually tailored package at a quoted price. In all cases a provisional route will be suggested which you will be asked to approve. A detailed final route sheet will be available as soon as hotel bookings have been confirmed. Hotels are chosen carefully, and if the Tour Manager books you into one that he has not previously used, he will tell you. The accommodation would be predominantly 2- or 3-star standard, with ensuite facilities. The hotels provide soap and towels and very frequently shampoo and a hair dryer. Tours include breakfast and an evening meal of at least three courses. A meal at a set price will have been booked, which may or may not include a choice. If you are unhappy with what you are offered, however, the hotel should provide you with an alternative. You are responsible for any drinks consumed with the evening meal or in the hotel bar. If you are a vegetarian or a vegan, or have other dietary requirements, remember to say this on your booking form. You must make your own arrangements for transport to and from the tour. Although the start and end points of the tour are near to the Bike Bus drop-off and pick-up locations, Valence and Orange are well served by other modes of travel. Remember the terrain is mountainous and unpleasant weather can occur at any time of year, so bring clothing to ensure that you can remain warm and (reasonably) dry. In summer it can also be very warm, even hot, and you should be prepared for this. The use of sun cream is recommended. A touring cycle, hybrid or lightweight ATB with a bottom gear of 27 inches or less is suitable, but this must be in good working order, especially the brakes. Do not assume that there will always be a cycle shop within a few miles. As you will have to carry all your luggage keep this to a minimum and ensure you have a sturdy carrier. You should have ridden your cycle fully laden before the tour to ensure you are happy with its handling. You should carry sufficient spares and tools to deal with punctures and minor repairs and a bike lock. Lights are recommended though they should not be necessary. Cycle storage is available at the hotels, but this might not always be under cover. You may wish to bring some waterproof covering in case of rain. You will be provided with detailed route sheets, but you are recommended to carry maps of the tour area. Michelin 1:150,000 departmental series maps 332 Drome/Vaucluse, 334 Alpes de Hautes Provence/Hautes-Alpes & 340 Bouches du Rhone/Var cover the area. Michelin Travel Guides provide interesting background information. This self-led holiday is available on a variety of dates between mid June and mid September. The suggested duration of 14 nights can also be adjusted if required. Please contact the Tour Manager to discuss the options available.